SCCM CMPivot has been introduced in SCCM 1806 and it’s making its way to be a pretty useful addition. If you are not familiar with this new feature, you can read about it in our previous post which describes how to use it. 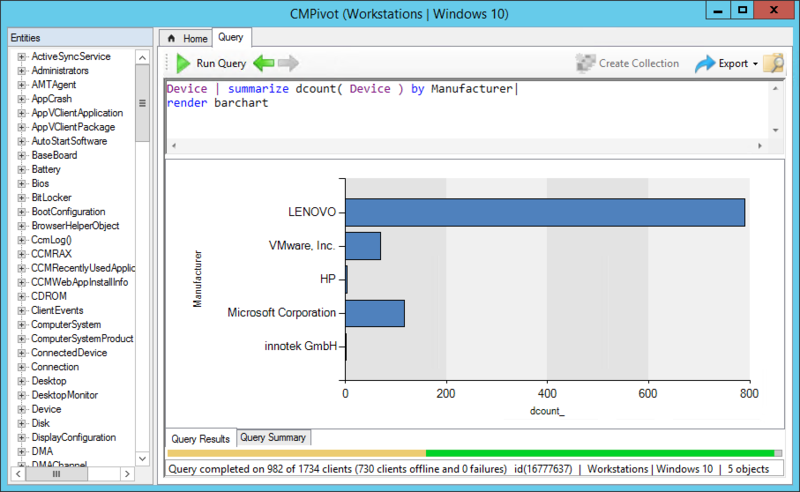 The goal of this post is to give you a list of SCCM CMPivot Query Examples. When we began using CMPivot, we were a bit lost. 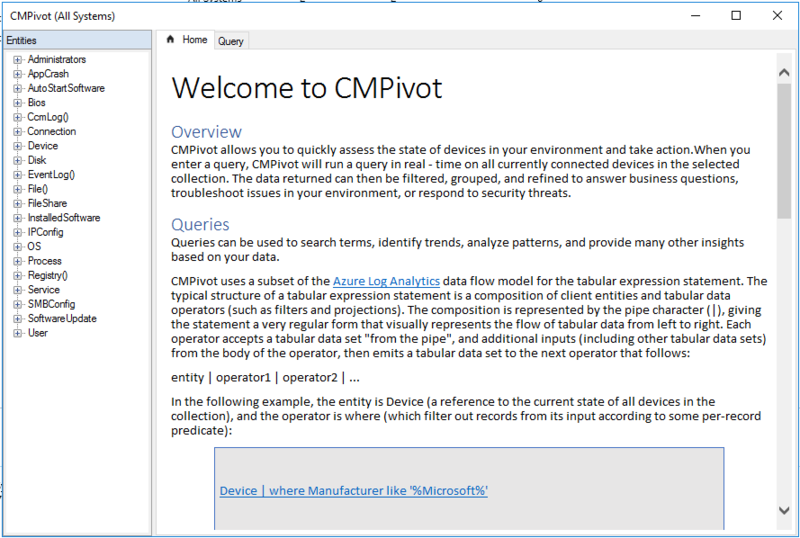 We are pretty comfortable with various programming language but CMPivot uses a subset of the Azure Log Analytics data flow model for the tabular expression statement which was new for us. After a while of playing with it, we thought it would be useful to share a list of queries that we build. 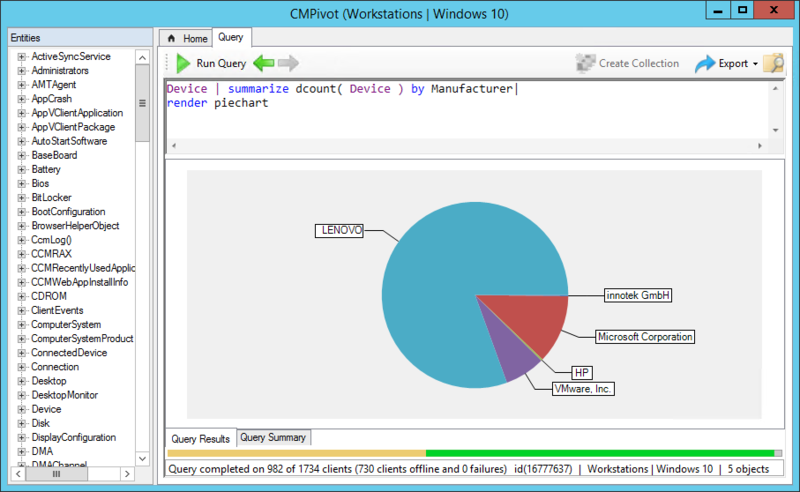 Here’s the SCCM CMPivot Query list, feel free to share your own and as in my other Set of Operational Collection script, this list will evolve over time so come back often to see that new addition we’ll make. We hope it helps you adopt this new feature. The Render operator supports only two properties in the source table and the last properties must be a number. I’m receiving an error message which states “Unsupported version of Powershell” when all of the targeted machines in the collection have at least 5.1 installed. Is there way to query the collection for installed software by ProductName and ProductVersion. I tried this and it failed. You need to include ProductVersion in the ‘summarize by’ section seeing as you want to filter with it. The support for operators seems to be inconsistent. For instance, “OS | where (Version like ’10.%’)” works fine, but “InstalledSoftware | where (ProductVersion like ’10.%’)” is causing query failures. In fact, I can’t get the “like” operator to work at all for filtering the InstalledSoftware dataset. Thank you so much, super valuable and I have logged onto and registered with the site!! Thank You. Just wanted to let you know that there is a small typo in this post.